It's Out Of Here: Asteroid Whizzes By : The Two-Way About the size of an office building, asteroid 2012 DA14 flew by Earth on Friday — coming within about 17,000 miles of the planet. According to NASA, asteroid 2012 DA14 — a rock thought to be about 150 feet across and the weight of about 318 fully loaded Boeing 747s — just flew past the planet. 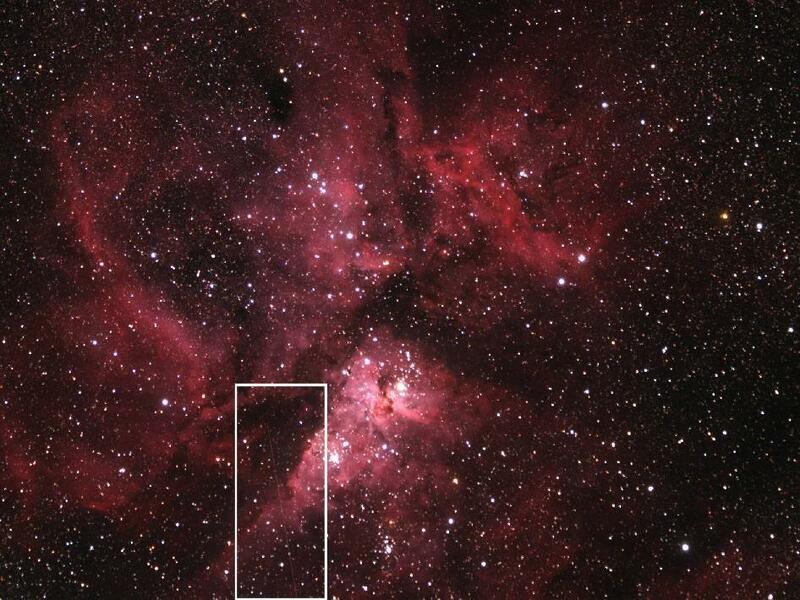 This image shows asteroid 2012 DA14 and the Eta Carinae Nebula, with the white box highlighting the asteroid's path. The image was taken using a 3" refractor equipped with a color CCD camera. The telescope is located at the Siding Spring Observatory in Australia and is maintained and owned by iTelescope.net. There's an asteroid the size of an office building headed toward — but, we're told, not directly at — our planet. Called 2012 DA14, it's supposed to pass within about 17,000 miles of us at 2:24 p.m. ET and then start heading away. NASA says it's not going to hit us, and is streaming its webcast of this event. We'll embed it in this post and get back to you, we trust, when the rock has passed by. If you're in the U.S., by the way, don't bother looking up. Daylight will obscure our view. If NASA's viewer count on its webcast is right, about 4.8 million people are tuned in. Update at 2:12 p.m. ET. A Minute Late? NASA just said the closest point of the approach may not happen until 2:25 p.m. ET.